(NaturalNews) For most people the concept of thirst or dehydration doesn't get much thought dedicated to it on a daily basis. Live until you get thirsty, then drink until you no longer thirst, and then continue living until you thirst again... right? Not quite. Most people treat thirst like a fuel gauge, but its true function is more similar to that of a warning light. By the time someone feels thirsty, they are already mildly dehydrated. When thirst is satisfied, it does not mean that the individual is fully hydrated. Why would anyone care about mild dehydration? Researchers have shown that mental acuity and coordination start to decrease at 1% dehydration and are significantly decreased at 2% dehydration. That's right; mental performance is significantly reduced by dehydration before thirst is felt. Because of this, it is important for people to put real thought into their hydration habits. The best ways for someone to combat dehydration is to become aware of daily hydration needs, pinch some sea salt into their drinking water and put thought into the types of beverages they consume. Most people will spout off "eight glasses a day" in regards to their daily water needs even if they don't follow that advice. The National Health and Nutrition Examination Surveys show that the average American consumes far less than the recommended daily requirements of water. 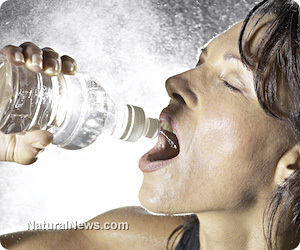 So, will increasing water intake to eight glasses a day be optimal for everyone? No! Everyone has different water needs and a 400 lb computer programmer is going to have different daily needs than a 90 lb yoga instructor. The best goal is to strive to drink half your body weight in ounces daily. With this formula, a 100 lb person would want to drink 50 oz of water per day. Summer heat and exercise are just two examples of things that will drive up the amount of water that a person needs to drink each day. Adding a pinch of sea salt to drinking water can also help tremendously in decreasing dehydration. This does NOT mean that you should use standard table salt or drink large quantities of water from the ocean. Crystal Himalayan sea salt can be found in most stores and should replace table salt not just in drinking water but also for food seasoning needs. Adding a small amount of sea salt in drinking water introduces essential minerals and electrolytes that the body requires to function. Popular sports drink companies have it right when they talk about the human body's need to replenish minerals and electrolytes, but their solution includes sugar, additives and other chemicals that are detrimental to the body. By using sea salt or looking up recipes for "natural sports drinks," people are able to reap the benefits of sports drinks without putting trash in their bodies. Although it may seem counterintuitive, water with some sea salt will do a better job at quenching thirst compared to plain water due to how the over 84 minerals in sea salt help hold water in the body. Fereydoon Batmanghelidj, M.D. is best known for his experiences healing prisoners with only water and salt. Dr. Batmanghelidj has written several books on the subject in which he outlines in more detail the proper amount of salt as well as all the conditions he believes are at least partially caused by chronic dehydration. The salt does change the taste of the water, but it is not something that needs to be used every time someone pours a glass of water, so it should be tolerable. Another thing to consider is the type of drink being consumed. Many people feel any liquid has essentially the same effect as water for the body. Some drinks actually have a diuretic effect on the body, meaning that they literally work to dehydrate the body. Coffee, other caffeinated drinks and alcohol are the biggest offenders in this category. When drinking alcohol, the body increases urine excretion by 10 ml for every 1 ml of alcohol consumed. This effect continues until the alcohol is no longer in the bloodstream. Because of this huge increase of water leaving the body, people consuming alcohol must carefully monitor their hydration levels and make sure to properly hydrate afterwards. An alternative to drinking water with sea salt for people who don't care for the taste would be coconut water. Coconut water has many great hydration properties and is rich in electrolytes. People interested in drinking coconut water should do research to find the purest brand available in their area. Kyle Price is a passionate and energetic leader in the field of health and wellness. He loves working with active young families and youth sports. He has a vision to change the dismal healthcare climate in America by promoting personal responsibility and educating people on making healthy lifestyle choices. His personal hobbies include: Scuba Diving, Motorcycles, Ultra light Backpacking, Mountain Biking, and public speaking.